Whether it is Bangalore or Mysore or anytown India, City authorities have just one solution to meet the relentless menace of vehicles on our roads. Which is to kill the trees coming in their way and widen the road, and reduce if not erase the space for pedestrians. And whether it is Bangalore or Mysore or anytown India, hapless residents have just one recourse to this state-sponsored murder. Which is to hug the dear trees that have served them so well for decades and hope that somebody, somewhere will be touched enough to cry halt to the madness. 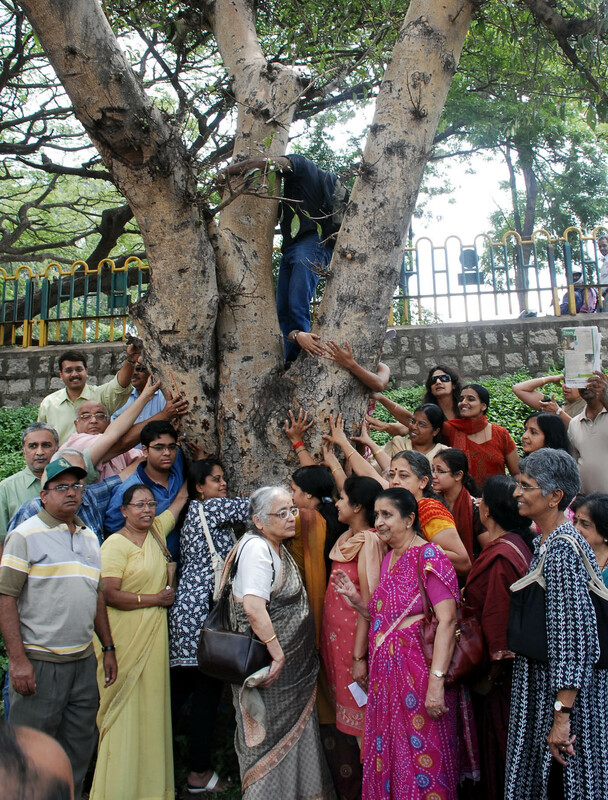 And so it was near Sankey tank in Bangalore on Wednesday, when longtime residents staged a protest. Funnily, when a tree had to be similarly murdered in the august precincts of Raj Bhavan a few years ago, the governor’s office made a big song and dance of carefully transplanting the old tree. Are trees which offer shade, breeze an comfort to VVIPs somehow more important than those that provide the same pleasures to the aam admi, aurat and animal? Any wonder the State should want to decline the UNSECO heritage tag for its most pristine spots? This entry was posted in Issues and Ideas, Mysore-Bangalore and tagged Churumuri, Karnataka Photo News, KPN, Raj Bhavan, Sankey Tank, Sans Serif. Bookmark the permalink. What was it that Rajiv Gandhi said about big VVIP trees? when they fall the earth shakes AND humans are burnt alive, raped, the killers protected. Well said Madhu. Bangalore used to be Garden City not merely because of the public parks and gardens but also in part to private home gardens. Many of the public gardens still exist though not in the former glory. But the all the private gardens have vanished. All the so called OLD BANGALOREANS have renovated/ rebuilt their houses without leaving an inch of open earth. And the few millimeters that left is firmly sealed with concrete and washed twice a week with soap. One or two bedroom homes have been expanded into 3-4 bed/4-5 bath ones. And the rest have sold your homes to North Indians who love living in 100% concrete space. When we grow trees and plants these people start complaining about dry leaves and so on. Have these protesters planted any trees in their home? Our home is on a 40×40 plot and have 2 coconut, 1 bread fruit trees in addition to hundreds of herbs and shrubs. All in a little space. If you are genuinely interested, you can have a great garden even on a small patch. Have these people done anything, other than complaining to neighbors like me. And about UNESCO; please don’t comment without knowledge. Many of my relatives live in remote villages in Western Ghats. They have neither electricity nor tar road even to this day. UNESCO tag will hamper providing these facilities to them. This has already happened at Hampi which is a UNESCO monument. Some time ago govt. was trying to build a bridge so that villagers inside Hampi area can travel outside during inundating monsoons. But UNESCO vetoed it. How should the villagers travel out ? You live in cities like Bangalore and Delhi and enjoy metro, ring road etc. Why shouldn’t they want what you already have. There is a lot of screaming, shouting, and protesting against 19 trees being cut for the widening of Sankey Road. Let me be clear where I stand. I HATE THAT THESE ANCESTRAL TREES HAVE TO BE CUT DOWN. My love for trees stems out of a very Neanderthal concept of the pleasure of the shade in a scorching sun. That’s all I need to love it & not have it cut down. But I also understand that this is something that needs to be done. I have no clues to the accuracy of this data but I know one thing from what I see – Our traffic has grown 100x as compared to our roads most of which are as old as the people they are named after. Anyone who has to “drive or ride” through Sankey Road “everyday” in peak traffic will understand the need to sacrifice a few trees to widen the road to cater to the ever growing population of vehicles. Well there are those more fortunate, “busy reading the morning newspaper or browsing the net on their laptops while their paid drivers steer them “effortlessly” through this traffic” mortals who consider this as Armageddon or a prelude to the 2012 end of the world scenario. During the recent elections, I’ve had the enlightening pleasure of canvassing for a political party (my alliance has no bearing to my personal opinion in this article) & have done the rounds of almost every house. Now this was both interesting & shocking to learn that other than the most common complaints – irregular water supply, bad roads, garbage collection woes, etc, one other most common request was – permission to cut down trees – some of which were in front of their house blocking their entrance, trees whose leaves & branches were constantly trespassing ones property, trees which were on the verge of falling in the next 1mm of rainfall. I was shocked beyond belief as to how many people asked for permission to have trees near their homes to be cut down. I’m sure this is common in every area of Bengaluru. I’ve seen educated professionals, doctors & even hospitals that have cut down trees which were inconvenient to them or merely detrimental to the front elevation of their palatial new homes. Rather than prevent or hamper growth, why can’t we implement a more constructive approach to this issue? Why don’t these so called environmentalists plant 10 saplings for every tree being but sacrificed for the cause of urbanization? Why don’t you decree that every home along with RWH, Solar water heating, etc, should also have at least one tree within the property? This way, we will have lesser sft of concrete & share some of our space with “mother nature” which we claim to love so much. Why should only public spaces bear the burden of saving Mother Nature? When will we as individuals take responsibility and grow or retain existing trees within our properties? Everyday there are atleast 19 trees being felled (or should I say murdered as the environmentalists shout) in Bengaluru itself to make way for a new multi-storey obscenely high rental fetching residential or commercial complex. When will we sacrifice our greed to capitalize on every square inch of land and allow a tree to survive? The answer is probably when the tree can afford to pay Rs. 50/ sft rent per month & calculated by the super occupied area of its branches & the area covered by its leaves blown by the wind perhaps. I have traveled many times on the Sankey tank bed Road and never felt there is a need to widen the Road and it will not serve any purpose. At the most a kind of magic box at Bhashyam circle should take care of the problem to start with as it costs much less. Further down near Cauvery theater the much criticized Magic box is doing its job adequately for the same traffic emanating from Bhashyam Circle. If there is a pile up at Magic box occasionally it is more due to bottlenecks further down on Bellary Road. On the other hand a New Road from Sadashivanagar Police station to Mallesawarm 18Th cross will be more useful and automatically reduce the traffic on Sankey tank road.